An outbreak of dog flu has spread through the city of Megasaki, Japan, and Mayor Kobayashi has demanded all dogs to be sent to Trash Island. 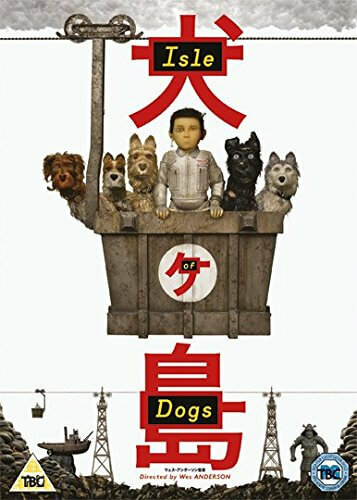 On the island, a young boy named Atari sets out to find his lost dog, Spots, with the help of five other dogs... with many obstacles along the way. Starring Bill Murray, Frances McDormand, Yoko Ono and many more! Cute and funny at times. For a movie without a ton of dialogue, and some of that dialogue in a language I don't understand, it was still easy to know what was going on and enjoy it. These dogs are such hams though. Each with their own personality, bringing these dogs to life. Literally. They talk, and in English. Lots of adventure. A few laughs, and a good story. They say it's not for kids, but I don't see why not. They may get bored with the lack of voice, but there's not much in there they shouldn't see if anything at all.